Specialist chip repair service to bath, basin and shower surface. Porcelain, acrylic and enamel fix. here’s an acrylic shower tray repair video. Close colour match and proper levelling the damage, makes it hard to find after only one coat of a resin (but there’s more to finish). 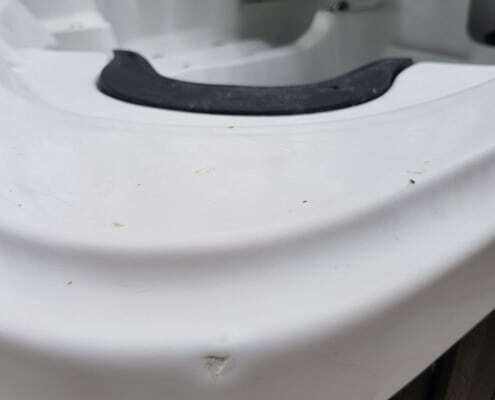 Small cosmetic repairs to the sanitary ware (and other hard surfaces), commonly known as ‘chip repair’ or ‘invisible repair’ is a cost saving method of fixing the scratches, dings and minor imperfections. Instead of replacing or resurfacing the whole unit, it’s often possible to fix it in a matter of hours with minimum disruption for a fracture of a cost. 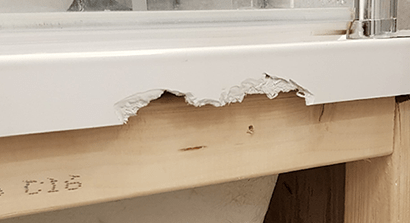 The methods vary with each substrate and situation, but as a general description, I do the service by reinforcing and levelling the damaged spot. An accurate colour match then follows structural repair and blending into the existing area keeping the restoration as small and invisible to the naked eye as possible. “We are delighted with the work that Tomasz has carried out in our bathroom and kitchen. Our sink was restored beautifully and it is impossible to see the original crack. He is friendly and reliable and works with great professionalism. He took such care carrying out the work and I would be delighted to use his services again. 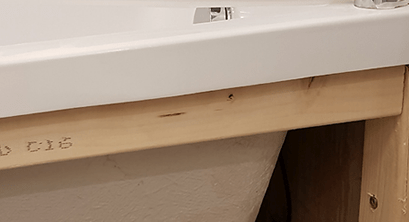 Whether it’s cracked acrylic bathtub or chipped enamel ware, the solution can sometimes be more straightforward than having a team of builders to rip off the tiles and replace your sanitary ware, creating disruption, unnecessary costs and waste. 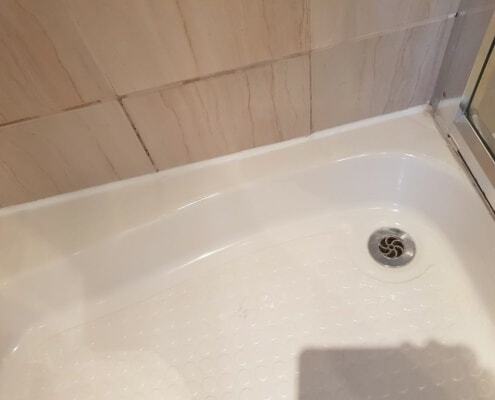 If you are a tiler, builder or plumber, who just installed the new bathtub and dropped the tile or tool at the very end of the job that took you days to finish, I can be that guy who saved the day and did the magic (and many times I already was). 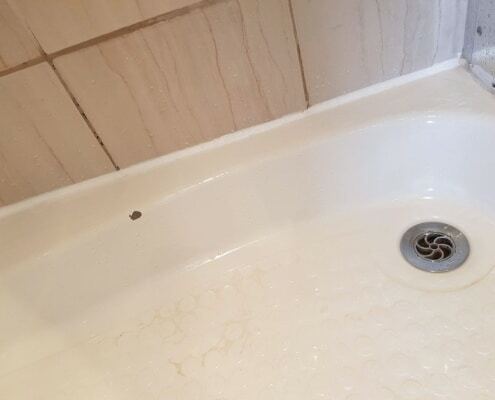 I always try to go for the most effective solution and whenever possible, small spot repair can prevent from replacement or a full resurfacing of the sanitary piece. More complicated and more significant damage can be treated as the full resurfacing job. For example, if there’s more than three to five chipped enamel places or multiple scratches on acrylic base after glass shower doors explosion, I strongly recommend repairing the whole surface instead of having them spot-sprayed in so many places as it’s offer a better final result. 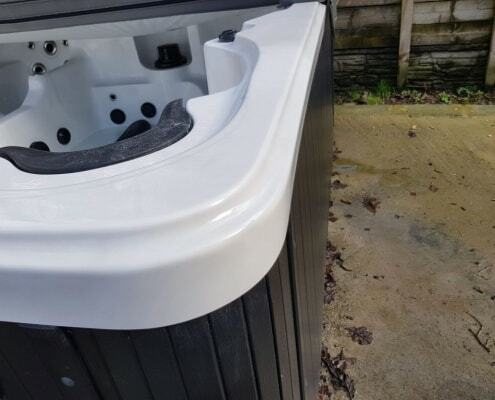 With minor scratches, discolouration and slight imperfections on acrylic baths, sinks or shower bases it can sometimes be possible to restore the surface with chemical cleaning and polishing. However, not every item I can save this way, and I can’t polish or chemically clean the vitreous enamel as a long term solution. It’s too hard to be polished, and if it’s rough, cleaning is only a step to a full resurfacing job as without, it will catch the dirt within days again. Please contact me for the recommended solution, if you’re not sure if this type of repair would help. A quote is always free and can save you hundreds of pounds comparing to replacing the damaged bath or cracked porcelain sink that is not in production no more. Cost saving potential and environmental friendly solution as the offered service, is not limited to the bathroom area only. 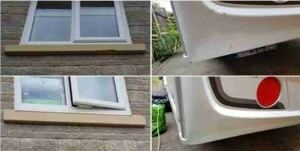 I can repair majority of a hard surfaces! My ‘bread and butter’ is a sanitary ware fixing, but please check my gallery to see repairs from inside and outside the household, from stone thru wood and metal, acrylics and PVC.